Diego De La Hoya (20-0, 9 KOs) of Mexicali, Mexico hosted a media workout at Wild Card Boxing Club ahead of the June 8 edition of Golden Boy Boxing on ESPN at Turning Stone Resort Casino in Verona, N.Y.
De La Hoya will defend his NABF and NABO Super Bantamweight Titles against Jose “Sugar” Salgado (35-4-2, 28 KOs) of Cozumel, Mexico in the 10-round main event. ESPN3 will steam the fights live beginning at 9:00 p.m. ET/6:00 p.m. PT. ESPN2 will air the fights at a delayed start time of 12:30 a.m. ET/9:30 p.m. PT. 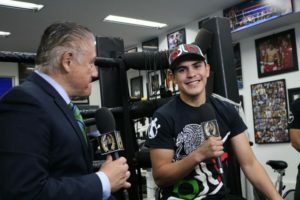 ESPN Deportes will air the fights the following day at 9:00 p.m. ET/6:00 p.m. PT. De La Hoya vs. Salgado is a 10-round super bantamweight fight for the NABF and NABO Super Bantamweight Titles presented by Golden Boy Promotions and Don Chargin & Paco Presents. The event is sponsored by Tecate, “THE OFFICIAL BEER OF BOXING” and Hennessy, “Never Stop, Never Settle.” The fights will take place on Friday, June 8, 2018 at Turning Stone Resort Casino in Verona, N.Y. ESPN2 will air the fights at a delayed start time of 12:30 a.m. ET/9:30 p.m. PT. 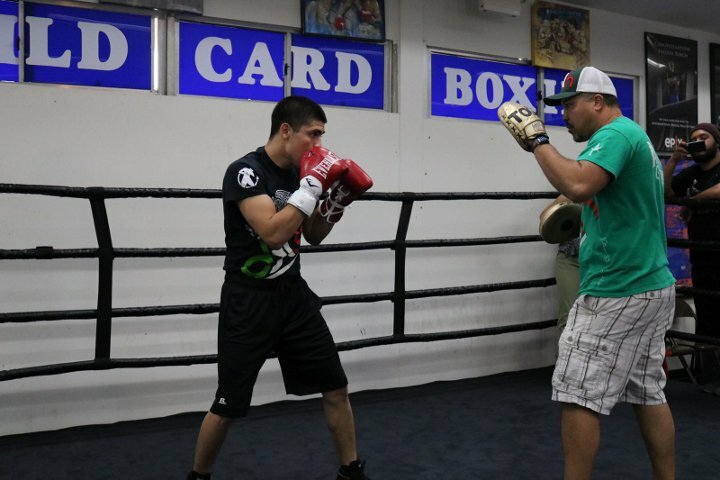 ESPN Deportes will air the fights the following day at 9:00 p.m. ET/6:00 p.m. PT. ESPN3 will steam the fights live beginning at 9:00 p.m. ET/6:00 p.m. PT. Tickets for this matchup are on sale and are available from $34 and $85 for the first two rows ringside, $70 for remaining ringside seats and all others priced at $49, $45 and $39 plus any applicable fees. Tickets can be purchased at the Turning Stone Resort Box Office in person or by calling 315-361-7469 or online at Ticketmaster (www.ticketmaster.com).